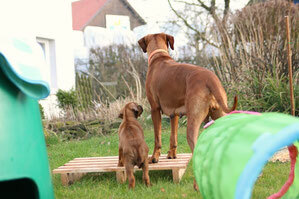 We, that is Eileen & Gary and family, live with our four-legged friends right on the edge of the Sauerland. The small Village Bentrop has been our new home since the beginning of 2013. We live in a large, old half-timbered house from 1870 on a plot of land 2300sqm with lots of possibilities. Hilly landscapes, vast fields, lakes and forests like the Arnsberg forest with approx. 480 km² area allow us to enjoy long, long walks and various other sports activities. Our lives without animals could never be imagined and have been with us for a lifetime - from the hamster to guinea pigs, rabbits, birds, cats, a horse and even a dog. Different dogs have already crossed our life, but only one breed is and remains so connected with us! The intensive search began in the mid-1990s ... and it was not until the summer of 1999 that our first Rhodesian Ridgeback was introduced to us. 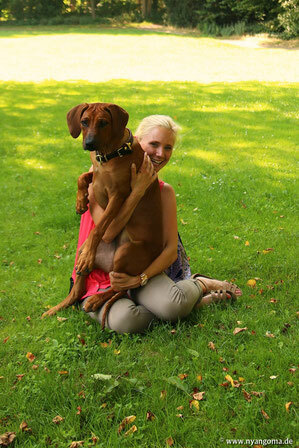 A loyal soul, who left a very big gap in 2008 and let us show and feel the peculiarities of the Rhodesian Ridgeback. In the summer of 2008 we were allowed to pay all our attention to our family addition "Barmani". A friend who walks with us through "thick and thin". Since the summer of 2012, our southern French Mademoiselle "Hluhluwe" complements our pack, which embraces our boys daily with her self-confidence. The first Nyangoma litter is born - our Lui gave 9 wonderful puppies in the light of day. From this litter our little sunshine aka Mrs. Yellow can stay with her mum and us and now hears the name "Jatoo". In addition to our dogs since 2002, our equally loyal and devoted Arabian mare "Nashy", who has sneaked into our hearts at the age of 16 months.